A few hours after the Soyuz TMA-13M spacecraft is launched with Alexander, Max and Reid on board, the International Space Station will fly over Western Europe. You can see our ISS from Earth just by looking up at the right time; here’s (all times in local time: Central European Summer Time CEST). The first good chance to see the space station and the Soyuz from Central Europe will be around 02:37 on Thursday morning. The ground track of the station for this pass is shown in the map. Observers directly on this line will see the Station pass right overhead. The station will come from the Southwest and move toward the Northeast. It will pass into the shadows at 02:36 and, depending where you are, you would see the station come out into the sunlight high in the sky (in France) or lower (in Germany and further East). To the North of the ground track, the ISS will peak in the South (the lower the further away you are from the ground track); observers South of the ground track see the station to the North. Using the bright reflection of the ISS as a beacon, it should be easy to see the Soyuz as well. At the time of this pass pass, around 02:37, the distance between the station and Soyuz will be about 100 km, which amounts to an angular separation of 13° if the they are flying directly overhead – this is about the same angle as that subtended by your four spread fingers (excluding the thumb) when holding your hand at arm’s length. This angle will decrease the lower in the sky you see the space station and Soyuz. Both spacecraft will move across the sky on a similar trajectory. By the time the spacecraft reaches the Eastern border of Poland, they will only be separated by about 80 km. A second possibility to see the space station from Europe will occur around 04:14, which is about half an hour after their planned docking. 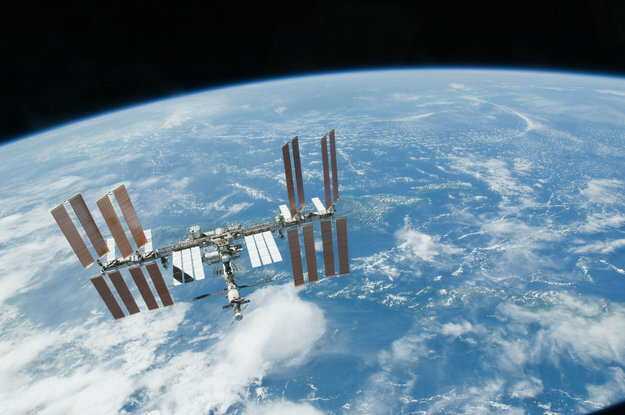 In order to get accurate data for the pass of the International Space Station for your specific location, you can check Heavens-Above or the ESA tracker – but the information in this blog post should be enough to find both the ISS and Soyuz. For information on how to photograph the spacecraft as they pass overhead, read this excellent blog post on how to photograph ATV (different spacecraft but the same techniques apply). Please share any pictures you get with us, through links in comments to this blog post. Just a note: the image with the article shows ESA’s ATV 3 cargoship, not the ISS. CONGRATS! FOR THIS GREAT LAUNCH – GUTE REISE ALEXANDER & COLLEAGUES…. HAVE NOW A GREAT & SAFE DOCKING & HATCH opens at ISS AS WELL AS TRIP THE NEXT MONTHS IN YOUR ISS….. in our thoughts we’re close beside you our Swabian!!! We Germans (Swabians) are so proud of you!! !